This program is a fantastic way for the next generation of volunteers to get involved and it helps high school students investigate the professional world of teaching, recreation or therapeutic recreation, rehabilitation services, volunteer management or special education! We train you to work with adaptive students and equipment. Training begins in November and continues through December. Volunteering with participants begins in January. Junior Instructors will always have an experienced volunteer with them as they hit the slopes! Lunch is usually spent with the student and/or group. Alpine Ski and Snowboard Junior Volunteers must be 15 years of age or older. Schedule: The average volunteer day is from 8:30 a.m. – 4:00 p.m. Programs operate 7 days a week. We have 5-week programs that begin the first weekend in January and run for 5-weeks at a time throughout the winter season. In addition, we have custom groups that are scheduled on varying dates and durations. Typically a volunteer picks the same day each week to volunteer throughout season or can volunteer on various days with custom groups. Bronze Volunteers (15 years or older) are also known as assistants to the instructors, as their primary purpose is to ASSIST other staff and volunteer instructors with lessons. If you are 14, you must be turning 15 during the ski season. Bronze volunteers commit to 1 full day of training and 2 full days of volunteering. For every 2 full days of volunteering, a Bronze volunteer will receive 1 day of free skiing at Winter Park Resort (if they do not already own/purchase a season pass). Junior Silver Volunteers (16 years or older) are fully-trained NSCD instructors that commit to 5+ instructing days per season. New volunteer instructors to the winter program are required to complete 4 on-mountain training sessions their first season and a total of 5-6 within a calendar year. Returning volunteers are only required to complete 1 refresher training. Silver volunteers will receive a limited season pass to Winter Park Resort, which will cover all training and teaching days, plus 5 free days. Gold and Silver Volunteers must be 16 years or older. If you are currently 15, you must be turning 16 during the ski season in order to be a Gold or Silver Volunteer. Experience the world of adaptive sports first-hand by helping the NSCD run a variety of sports programs! Most of these activities will be held in camp or clinic-type settings in the Denver metro area. Junior volunteers can also support the NSCD staff by assisting with rock climbing and water sports; canoe, kayak, stand up paddle board (SUP) and canoeing programs. Volunteers will also assist with set-up and breakdown of all activities. Catch, groom, tack, play recreational games or take your participant on the ride of his/her life! Our volunteers play an integral role for our participants, providing support, encouragement and enthusiasm throughout the lesson. 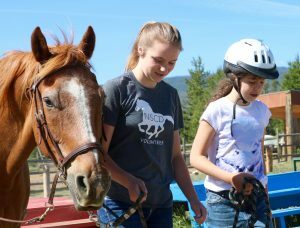 You do not need to have experience riding horses to volunteer for this program, we will teach you what you need to know! Must be able to stand on your feet for long periods of time, be able to walk on various terrain (sand, dirt, rock, etc.) and be prepared to work in all weather conditions.